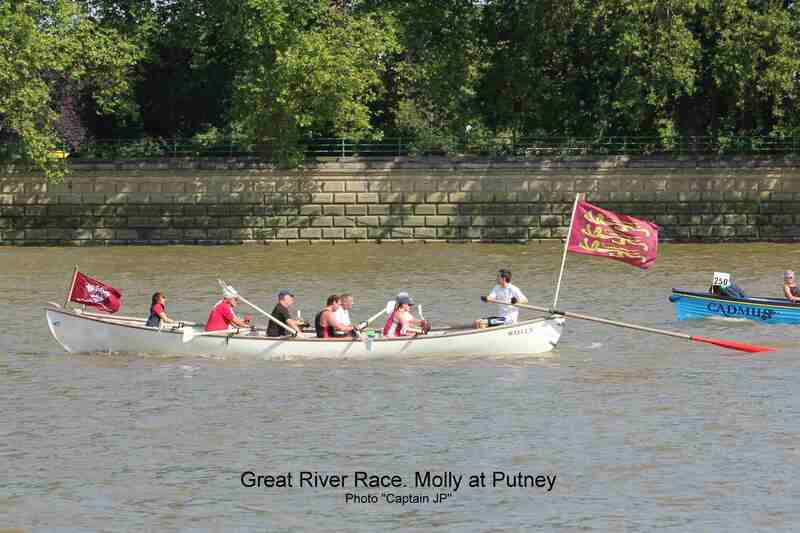 Another GREAT River Race for Molly and crew. - Molly's Tenth, Henley Whalers; Twentieth! 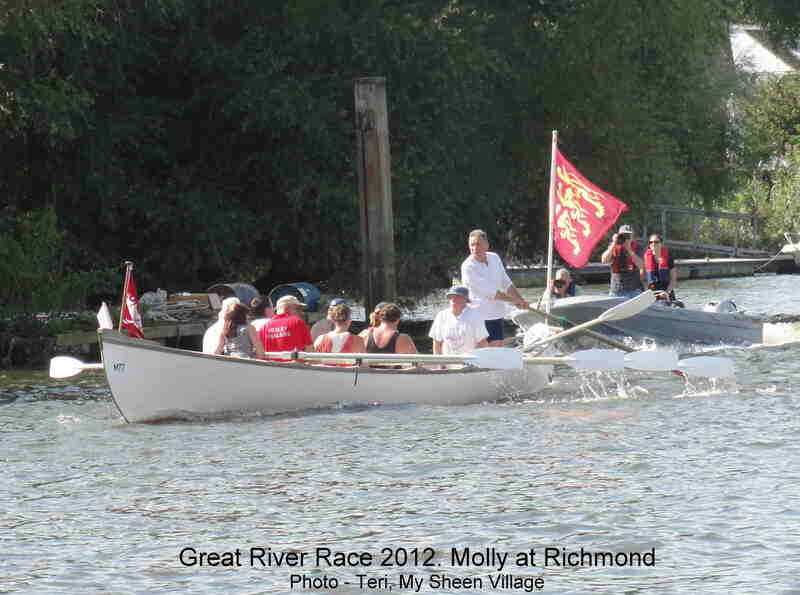 Last year Molly had a crew of 12 including 3 students. This year she raced with 10 crew, including 3 UTRC members. 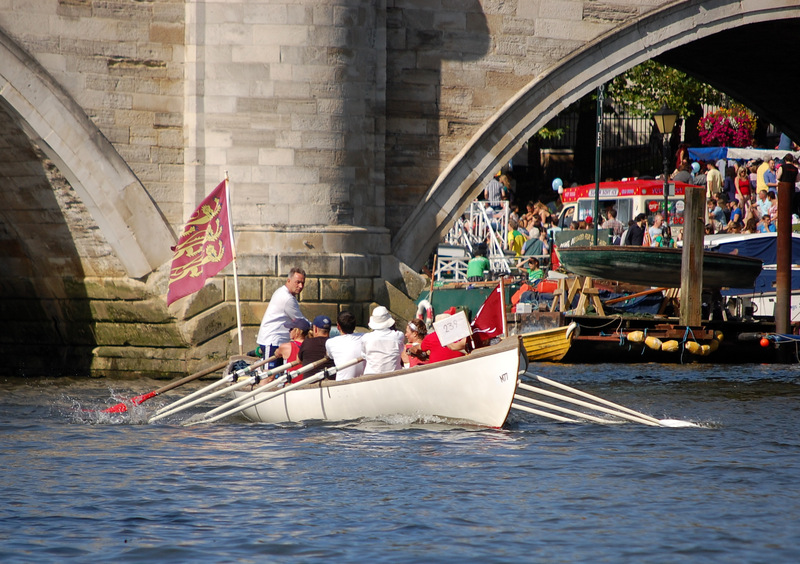 Acknowledged as the boating championship of Europe, The Great River Race is considered to be the biggest and most prestigious event of its kind, and is often referred to as a waterborne Marathon, covering 21 miles through many world-famous sights of central London. Not that there is much opportunity to admire the scenery. 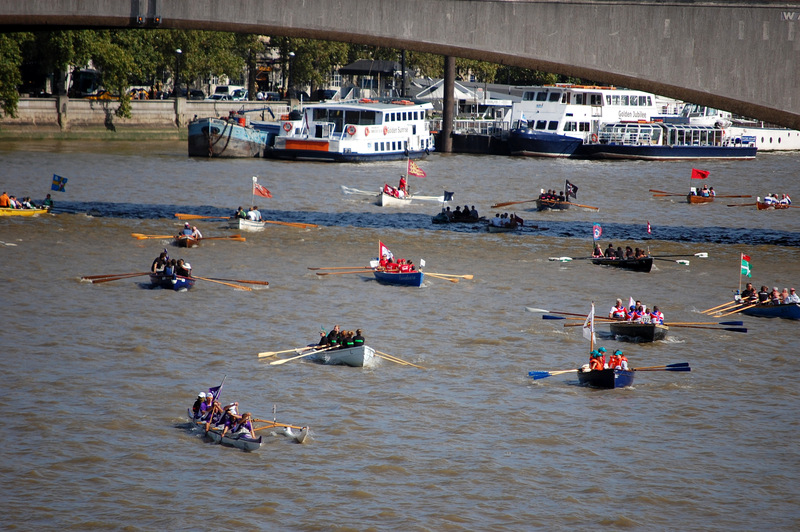 Light traffic and little competition for the slipway made arrival and launching at Poplar easier than usual. Time to relax and gaze across The Thames toward The "Cutty Sark", Greenwich Naval College, Maritime Museum, and the Observatory (of GMT fame). Time even for a second breakfast (for some) before boarding. A short pull up toward the waiting area, and a few circuits to admire the fleet, gave us time to warm up and settle into our seats before joining the queue for the start. 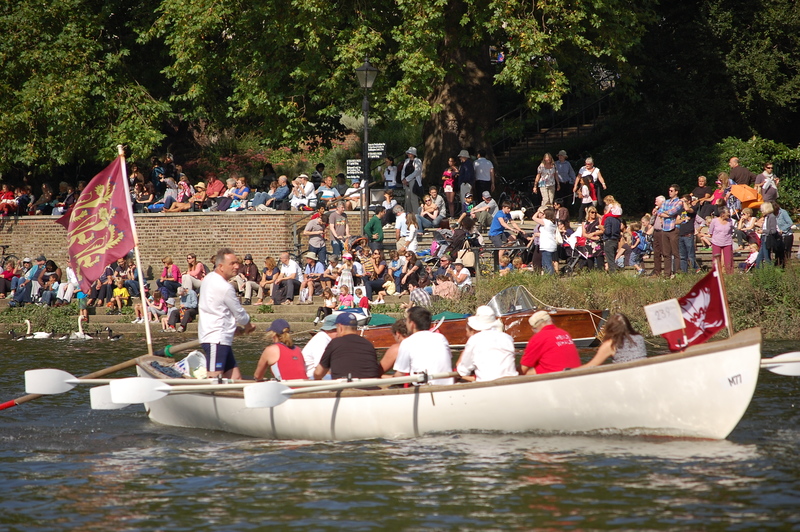 Some boats with low numbers coming the other way caused confusion, then as we were lining up for the start, Geoff was urging us on from the bank. A quick chicane got us over the line within a few seconds of our allotted time, then we were full-on, and comparing our speed against the competition. We passed a capsized dragon boat - Molly gliding serenely over the wake of an outbound passenger vessel. Tower Bridge always seems a long time coming, but at last the roar of the crowd rose across the waves. HMS Belfast and London Bridge were soon behind, and the current really picked up through Blackfriars rail bridge - Molly was flying along. An experiment this year, enabled by having only 10 aboard, was for crew to keep their own seat whilst resting, the exceptions being the helmsmen (not that steering is much of a rest). This made for much slicker changeovers. (GRR rules stipulate there must be one "passenger" and one "cox" at all times). Each bridge became a "traffic jam" as we jostled for best position and tried to pick a line which would keep our speed up whilst cutting through the pack. "Close encounters" are an inevitable hazard in these circumstances..
Saint Paul's, The Oxo tower, South Bank. Did anyone have time to notice Big Ben? All these well known landmarks take on a new perspective but cannot be savoured as we race past. We were determined to keep overtaking as many, and be overtaken by as few, as possible. A Cornish Pilot Gig, "Cadmus", became our regular companion/competition. 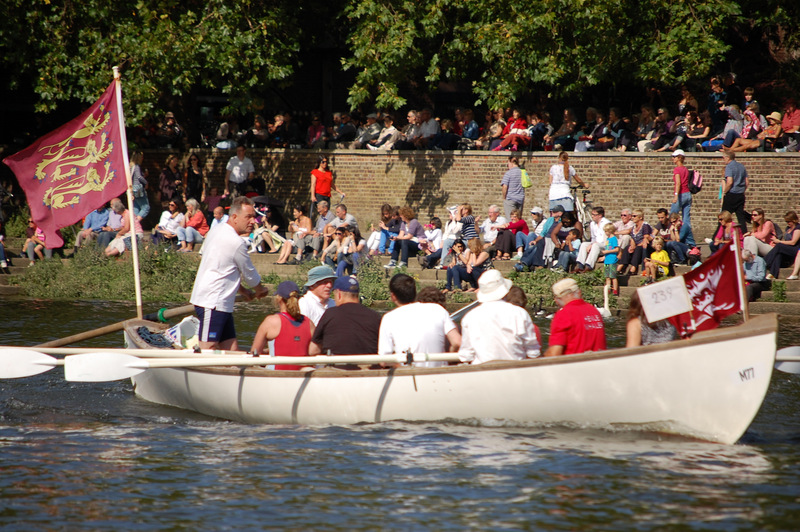 Ah, it's Putney and then the University boat race course. Chiswick bridge (end of the boat race course) signalled our last helm change. We'd done three crew changes so we'd completed 3/4 of the course. Kew rail bridge, Kew road bridge.Only 4 bridges to go! - Focus! Keep pulling! 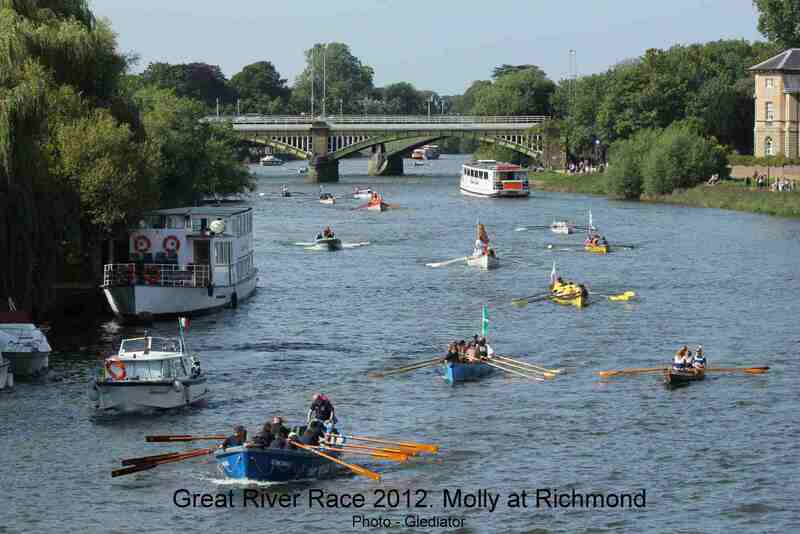 Richmond Bridge; "How much further?" (Only a mile.) Keep pulling! Will we pass another whaler? The trailer queue, and craning-out, worked so much better than last year. 4th whaler (Pollux) took 2:52:36; 3rd whaler (Cor De Bruin 2) took 2:45:40; 2nd whaler (Yellowfin) took 2:35:13; 1st Whaler (Amazone) took 2:36:20. So Molly was 3rd fastest whaler, in elapsed time (again). 6th whaler Noordvaarder 2:55:14; 7th whaler Smit Viking 3:10:46; 8th whaler Curved Wood 2:50:49; 9th whaler Maaike 3:03:52; 10th whaler Moos 3:05:30. FWIW - Cadmus (Salcombe Barbarians) - alongside Molly much of the way, beat Molly by 5 seconds, having started at 11:37:05. 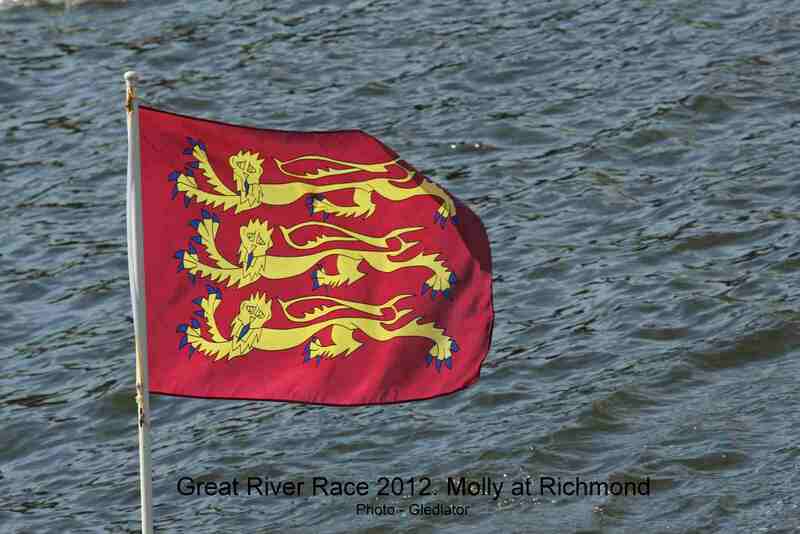 See the Great River Race website for other info, and Provisional Results 2012. Andrea noted - The average time for the first 110 boats was exactly 5 minutes slower this year than last year - which explains why a one minute improvement yielded 35 places improvement. So; Molly was one minute faster than last year, and most others were 5 minutes slower; .....! Our thanks go to Geoff, Molly's owner, for towing Molly to the start and from the finish, and to Steve for transporting crew (and beer). Well done all. Back next year? Pictures courtesy of; 'Captain JP', John Cooper, Steve Morton, 'strathkanchris', Teri 'My Sheen Village'.